Cyndaquil in game: 8,035 Who? Important notice! Pokemon Cyndaquil is a fictional character of humans. Ash Ketchum captured a Cyndaquil in Good 'Quil Hunting. 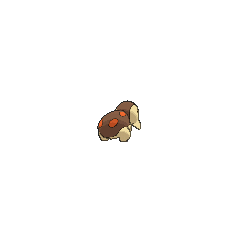 During its early days on Ash's team, Cyndaquil was easily tired-out (e.g. waiting a while for the flames on its back to ignite so it could use Fire-type attacks). Eventually, Cyndaquil overcame its shortcomings. Ash left his Cyndaquil, along with the rest of his Johto team (save for Pikachu), at Professor Oak's lab when he set out for Hoenn. Later, Ash called Cyndaquil back into his party for the Sinnoh League in An Old Family Blend!. It evolved into Quilava after a battle with Team Rocket's mecha. 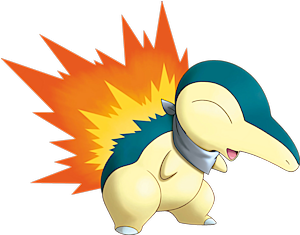 Cyndaquil is Jimmy's starter Pokémon that he received from Professor Elm. Cyndaquil first appeared in the anime in Don't Touch That 'dile as one of the three starter Pokémon Professor Elm had to give out at his lab. Cyndaquil has a role in Arceus and the Jewel of Life alongside the other Johto starter Pokémon, Chikorita and Totodile. Lucy has a pet Cyndaquil which appeared in Queen of the Serpentine. A Cyndaquil made a brief appearance under the ownership of a Trainer in the Lily of the Valley Conference in An Old Family Blend!. EP141 Cyndaquil Ash's Pokédex Cyndaquil, the Fire Mouse Pokémon. 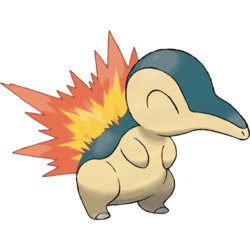 Normally mild and even tempered, Cyndaquil will shoot a scorching flame out of its back when upset. Professor Elm owned a Cyndaquil that was kept in his lab. It joined Gold's team to rescue the Totodile stolen by the thief Silver and was named Exbo for the explosive flames on its back. It later evolved into a Quilava and a Typhlosion. During the first chapter of the series, Cyndaquil was shown as one of the Pokémon Professor Elm was giving away. Cyndaquil is not a Poké Ball item anymore. It is only a trophy. Its appearance is based on the echidna, but it also has traits of shrews, and tenrecs, such as its long snout, and its closed eyes may be a reference to baby honey badgers, as its fully evolved form is based on one. When its fire is lit, the fire resembles the quills of the porcupine.